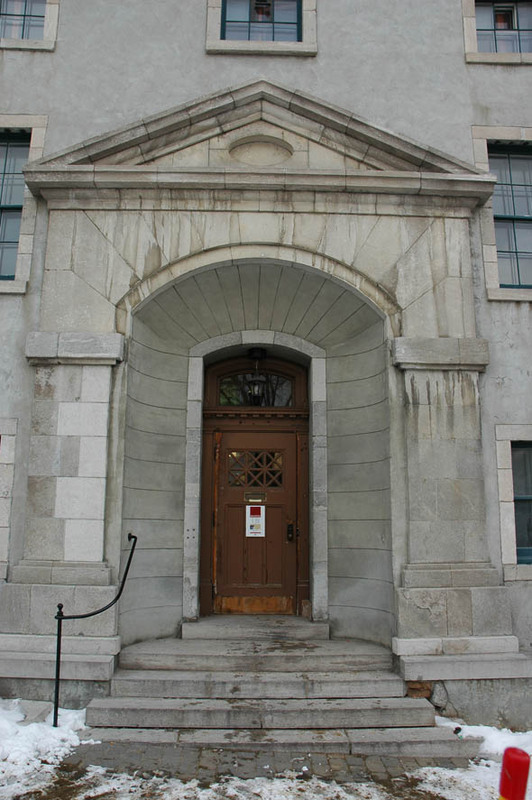 In the days of New France, the Royal Redoubt, stood on the site of the Morrin Centre. These enclosed defensive works were adjacent to the original city walls. Initially used as a military barracks, they came to house prisoners of war. Many died in the cramped and disease-ridden conditions of captivity. Some were traded for French prisoners held in Boston, but others stayed on. The current neoclassical structure was built between 1808 and 1813 as a common gaol. It was the first gaol in Canada to reflect the ideas of British prison reformer John Howard. Howard was opposed to houses of detention and called for houses of correction. Lashings were replaced by cellular confinement, work, and education. Prisoners were divided up according to the severity of their crime. Despite these reforms, public hangings occasionally took place from a balcony above the main door. The prison soon became overcrowded and Howard’s reforms could not be properly applied. Prisoners were transferred to a new gaol on the Plains of Abraham in 1867. Morrin College was the city’s first English-language institute of higher education. The school initially shared rooms with the Masonic Temple, moving into the old gaol after its conversion in 1868.